Size: 377 sq.ft. - 876 sq.ft. A uniquely designed "Haware Paradise" is a grand structure by Haware Propertieson 2.8 acres of land in west Kalyan. This paradise is also known as sport themed nano residential project, was launched in the year 2016. It offers 1 RK residential apartments to 2 BHK apartments. It is fully enveloped with numerous trees and greenery.Haware Paradise is a sprawling luxury enclave of magnificent Apartments in Mumbai, elevating the contemporary lifestyle. This extraordinary themed project’s units start from 377 sqft to 876 sq.ft built-up area. Haware Paradise homes are designed to create a positive lifestyle for its residents. 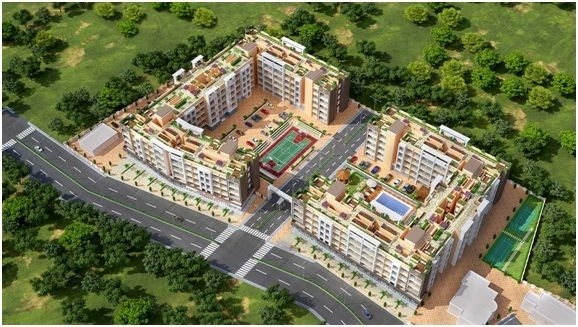 The project is giving choices of 1 RK, 1 BHK &2 BHK flats with utility shops. The 1 RK homes are available at 14.98 lac, 1 BHK at 22 lac & 2 BHK starting at 32 lac onwards.There is a need to create an atmosphere to promote sports and healthy living in our next generation. All 8 towers of Paradise are consisting of Ground floor+4 floors. It is conceptualized as a sports themed project. Haware Paradise is a home to 345 residents. These homes are crafted in such a way that it provides proper cross-ventilation, enough light in every corner of the living spaces and a wide road through the buildings. The paradise complex is well connected to other regions via Kalyan Sape Road and Sonate - Bapgaon Road.The location Muthaval is a fast developing area in Kalyan. It is the nearest major railway junction to travel in and around the city as well as for long distance traveling. This locality has attracted many inhabitants due to its affordable housing options as compared to the main city of Mumbai. Kalyan has become a prominent place to reside in. This place boasts of all the required essentials of a well-developed place such as reputed educational institutes, hospitals, health care centers, restaurants and shopping complexes that has helped the place become a promising extension to the main city. This wonderful sports themed Paradise is beyond thane district at Kalyan near Bapgaon Road, Muthaval, Maharashtra.